Any aspiring manga artists? Surely you've heard that it's not easy, at least in the professional world. 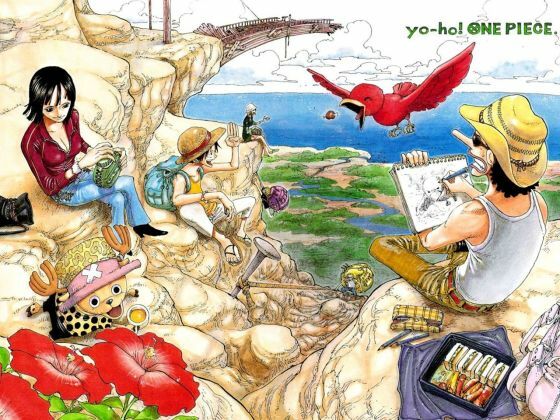 The average work schedules of famous artists of One Piece, Naruto and Dragonball have been released to the public for you to see. Oda only sleeps 3 hours a day. He'd wake up at 5AM and work until 2AM. With almost no vacations, he spends the first half of the week drafting, and the second half inking. After his chapter is complete, he spends the rest of the week on other work such as tankobon fixes and coloring. 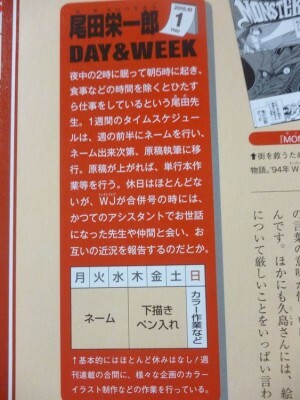 Here's the time schedule of Kishimoto when he was writing Naruto. On his inking days, the time spent on his desk totalled 19 hours a day. Tough! When Toriyama was writing Dr.SLUMP, he'd spend 3 days on drafting and 4 days on inking each week. Apparently his sleeping and waking times were so chaotic that he'd just go to sleep once he reached his limit. Otherwise, he'd do nothing but draw. In his Dragonball days however, his record speed for finishing one chapter was in a day! Oda, please don't die. Finish One Piece first. This is an occuptation for crazy people. That's insane... I definitely need my own time. Wow! I'm surprised they can handle so much work. I guess all that effort is what produces such great works! Keep it up, but don't overdo it!